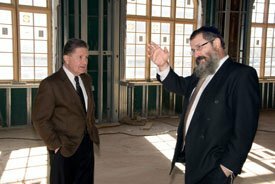 Now a unique partnership with Saint Peter’s Healthcare System is allowing Chabad, a hub of activity of Jewish life on campus since 1978, to take the concept to another level. Rutgers President Richard McCormick tours the newly expanded Chabad House with Rabbi Yosef Carlebach. At Chabad’s National Founders Chanukah Dinner, Saint Peter’s president and CEO Ronald Rak announced that the medical system is underwriting a suite of rooms in the newly enlarged Chabad House. These will be used by observant families of patients at nearby Saint Peter’s Hospital who are forbidden by Jewish law to drive on the Sabbath or Jewish holidays. “Many times when people arrive in the hospital over Sabbath, while the patient was being taken care of the family members had no place to go. They had to stay on a couch or a chair in the hospital room,” says Rabbi Yosef Carlebach, Rutgers Chabad executive director. “We had a room one of our student lounges that could be converted at the last moment, but not on a permanent basis,” he says, noting that about 100 families have taken advantage of the makeshift accommodations over the last 15 years. When the privately funded $12 million expansion is completed later this year, its 55,000 square feet will encompass a dining hall large enough to seat 750 students; separate dormitory space for 72 men and 37 women; a state-of-the-art ritual bath open to the community; and exercise equipment on which students can work out while watching wide-screen televisions. To affirm the bond, McCormick presented Chabad with a portrait of Old Queens, the university’s most historic building, to hang in one of its most recently renovated.